Simply put this anime is about revenge. This revenge takes the form of war and destruction. [STORY] For the most part of the anime I found it rather boring. The story where the protagonist is bestowed with a "special power" which they use to destroy and take revenge to create a "better world" reminded me very much of the storyline for Death Note; but I guess pride and revenge are the main themes surrounding shounen animes. It took me a while to get into the spirit of the anime. The beginning was confusing and too many characters were thrown into the plot at the same time. I only got excited about the story on the third last episode which was the climax point of the anime. I must give the ending some credit though, because I thought that the producers created a wonderful cliff hanger for the second season. Now I can't wait to watch the second season. [ART] Code Geass has a very unique art style. It definitely falls into the shounen art style. The joints of the human body are depicted as very pointy and sharp. Quite a lot of the shots are shown from below, giving the impression that the characters have long legs and disproportional body sizes. [SOUND] I didn't really like the opening or ending songs. However, the background music used throughout the anime was very well composed and matched the atmosphere. [CHARACTER] While having many characters in an anime or manga makes the story interesting and provides many branches of potential development, however, introducing too many characters without fully developing each character is a waste and confuses the audience. I felt that there were too many characters to keep track of. But I guess in a war story you need to create lots of people so that they can die. I found it hard to like the main character, because he is portrayed as the evil one destroying the world, disrupting the peace and betraying friends. Nevertheless, Lelouch is a true bishie, and Pumpkin loves bishies. So in the end I think I do like Lelouch even though I disagree with Lelouch's actions. Further, Lelouch's seiyuu is one of my favourite seiyuus. The exact same things can be said about Suzaku. I Loved CC's voice. I was disturbed by the fact that Euphie was Lelouch's first love. Geez they share the same father...that's just wrong. [ENJOYMENT] I found that only the ending was enjoyable. The other parts of the story was confusing, and yet again let me complain about the overdose of characters that were poorly developed. [OVERALL] If you asked me whether I would watch this again, the clear answer is 'no'. However, I would recommend this anime to people who like shounen style and mecha. I wish that I read the manga before watching the anime. I think I would've enjoyed the anime more because I would've understood the plot better. If I may guess, my intuition tells me that Lelouch is going to die at the end of the next season - so time to watch season 2 and see what happens! 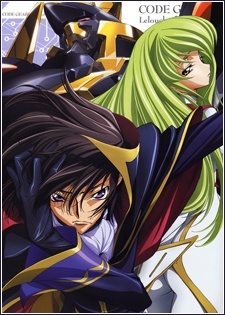 In my opinion Code Geass is one of the most amazing anime ever created. I love the fact that there are so many characters, and that Lelouch is forced to do bad things for the sake of the good. Anyways, watch the rest of it and then have your mind blown.